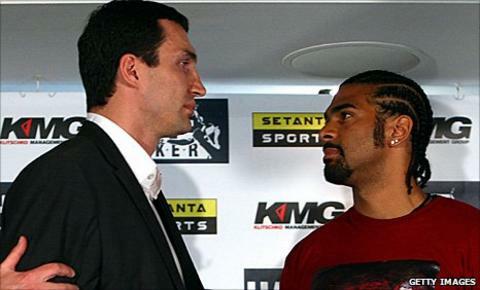 David Haye's world heavyweight title fight with Wladimir Klitschko will go ahead despite a row over tickets. The unification bout between Britain's WBA holder Haye and Ukraine's IBF and WBO champion Klitschko is scheduled to take place in Hamburg on 2 July. The dispute is over ticket allocations and German fans getting first choice. "The fight is on but the Klitschko brothers are giving me a headache over the tickets for my travelling fans," Haye told the Sunday Mirror. "I have given in to every single demand that they have made and they keep moving the goalposts." "I'm not going to roll over and let them get their way with the tickets - I want a fair allocation and at good prices. My fans have been loyal and I don't want a ­single one to be disappointed this time." The contracts for the contest at Hamburg's 57,000-capacity Imtech Arena have been agreed, but two press conferences, the first in Hamburg on Tuesday and the second in London on Wednesday, have been cancelled leading to speculation that the fight is in jeopardy. However, Haye's trainer and manager Adam Booth has laughed off those suggestions and is flying to Germany this week to resolve the issue. Haye had been due to fight Klitschko in June 2009 but he was forced to withdraw with an injury.